11 sites in the Stanford-HVO Kilauea GPS network were upgraded from Trimble 4000 receivers and Trimble groundplane antennas to Trimble NetRS receivers and Trimble Zephyr Geodetic antennas. Communications for each site were also upgraded. All sites were previously telemetered using Freewave DGR spread-spectrum serial radios. Sites are now telemetered using a combination of Intuicom wireless ethernet bridges and WiFi links. Three of the 11 sites are now telemetered directly to the Hawaiian Volcano Observatory (HVO) using solely the wireless ethernet bridges. 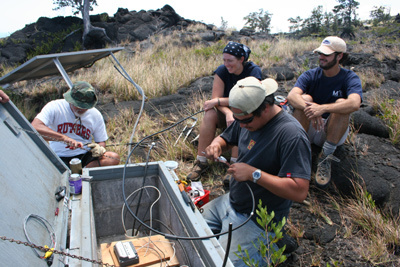 However, all other sites are telemetered to HVO via a site on Ele’ ele’, Mauna Loa . While this site was previously a repeater, it now hosts a 900 MHz wireless ethernet bridge master. The data are then transmitted to HVO via a 2.4 GHz WiFi link between Ele’ ele’ and HVO. This reduces 900 MHz traffic coming into the Observatory. Additionally, three GPS sites send data to HVO via Ele` ele` and a repeater at Kaena Point via exclusively WiFi. HVO has implemented WiFi successfully in several other cases. The upgrades were accomplished by personnel from HVO and UNAVCO with assistance from students from Stanford University within a two-week time period. Figure 1 - Maurice Sako and Kevan Kamibayashi (both HVO) work on cabling while Summer Miller (HVO volunteer) and Dan Sinnett (Stanford) look on. 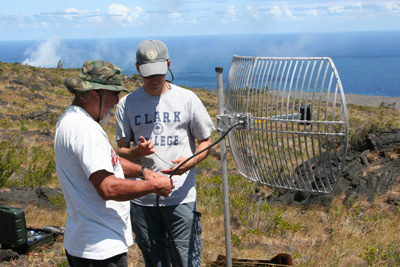 Figure 2 - Maurice Sako and Mike Poland (both HVO) work on the WiFi radio antenna with steam from lava entering the sea in the background.